I just don’t have the kind of stomach that likes to eat first thing in the morning – unless it’s coffee. Around 10 a.m. my stomach decides to wake up and starts growling at me. By then I’m famished but I always feel like it’s too late for breakfast and too early for lunch. Enter the frittata – an Italian word that’s fun to say and a meal that works for breakfast, lunch and even dinner. 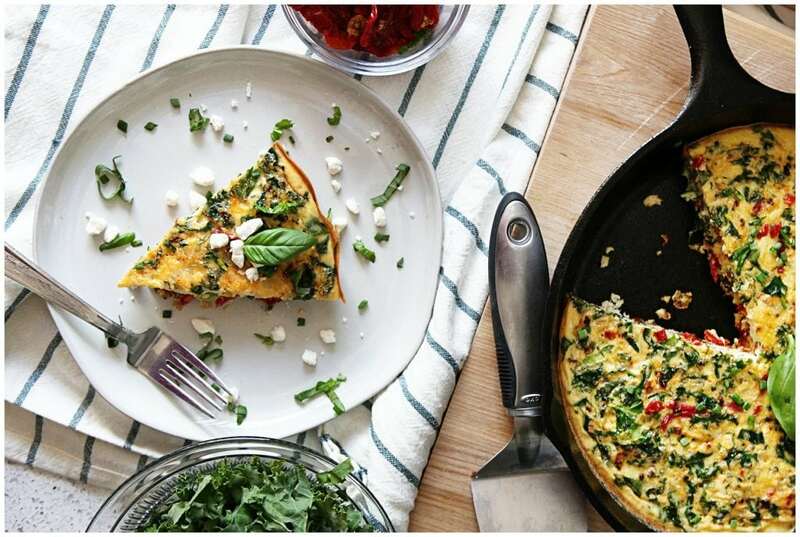 This Sun-dried Tomato & Kale Frittata is an egg-based dish like an omelet but much easier to make. When I was doing the Whole 30 I ate a lot of eggs and so I tried to make them more exciting and convenient by making frittatas. Instead of using regular milk, I used almond milk and I actually developed this recipe for a client for Instagram using almond milk. However, it’s so good I wanted to share it here too. When I photographed it for the blog I added in some goat cheese as a topping because I’m not specifically dairy-free every day and really have a love affair with cheese. You can make it with almond milk to keep it dairy-free or you can use regular milk and top it with your favorite crumbly cheese. Frittatas are really versatile and the recipe will work either way. Whether you make it with almond milk or regular milk, I love that this recipe includes so many nutritious ingredients. I know I make a lot of sweet dishes but I’m really more of a savory eater. Nutritious rich, delicious ingredients like sun-dried tomatoes and kale just speak to me. I could probably pair those two items with anything and make a dish that I would devour. 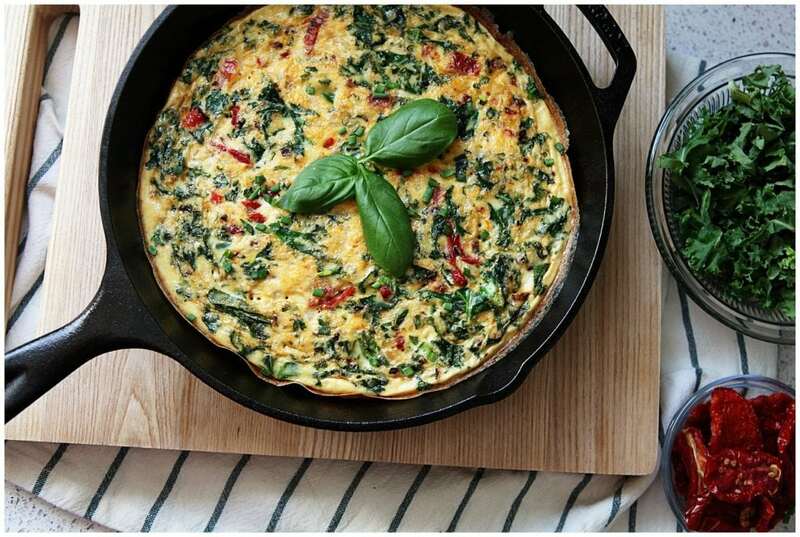 I used a 10-inch cast iron skillet to make this Sun-dried Tomato and Kale Frittata because I love the way it heats everything evenly. If you don’t have a cast iron skillet you can make this in a regular, deep pan or use a muffin tin for individual frittata. P.S. My husband liked this so much he went in for thirds and then just started eating it out of the pan with a fork (insert eye roll emoji). He also put it away for me and did my dishes (insert kissy face emoji). 1/4 cup of almond milk or regular milk. In a separate pan, add your olive oil and heat. When it’s hot add your scallions and garlic. Cook through until they are soft, about 3 minutes. Stir frequently. Add your sun-dried tomatoes and cook for another 3 minutes. Add your kale and cook until it starts to wilt and then turn off the heat and remove the pan from the heated burner. While the vegetables are cooking, mix together eggs and milk. Add the vegetables to your egg mixture and sprinkle in salt and pepper. Wipe your cast-iron skillet with a bit of olive oil and then pour your mixture into the pan. Cook for 18 minutes. If the middle isn’t done stick it back in for another couple of minutes. Oven times will vary. 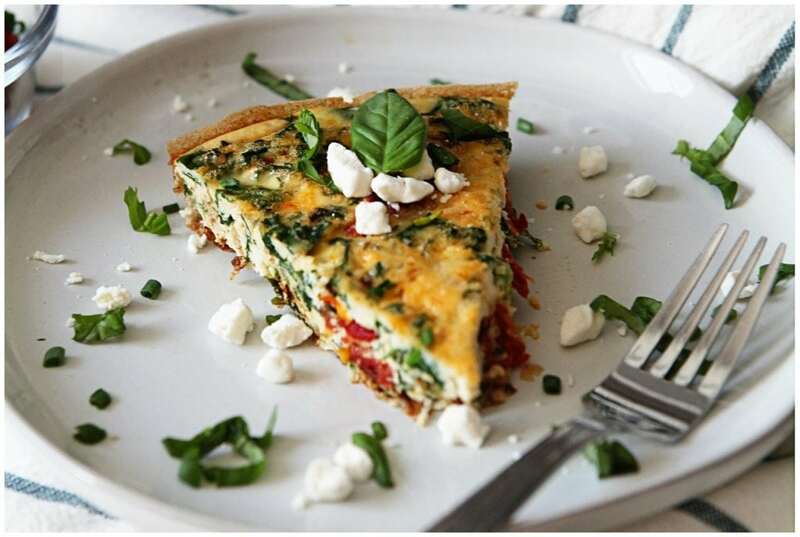 Remove, slice and sprinkle with any toppings like goat cheese, basil and chives. Add additional salt and pepper as needed. 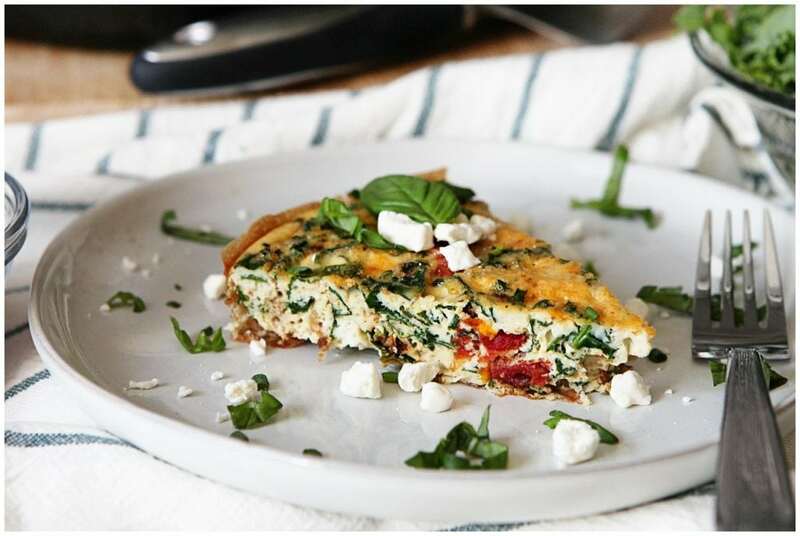 This Sun-dried Tomato & Kale Frittata is really the perfect dish for any meal, especially if you need to wait a bit in the morning like me. It’s easy to make, delicious and looks beautiful when served up next to some fruit, toast and jam or even a little guacamole. When I made this frittata on Sunday we also ended up eating it for dinner, which was nice because then I didn’t feel like I was cooking twice. It was an easy, tasty, light meal on a warm spring night that we could eat cold. I love the idea of making something like this for Mother’s Day Brunch (because if I’m cooking it had better be easy) or Easter and New Year’s brunch. Try it for one of these celebrations or just because! That looks delicious. I love a good frittata. I might make that for breakfast this weekend! This sounds exactly like something I’d make. The sweet tomatoes, bitter kale, and tangy cheese go perfectly together . . . yum! Now that’s the way to start the day. That looks so good, and all that protein will power you through the entire morning. This recipe has me drooling! I adore kale! This is so elegant in it’s simplicity that it would be perfect to serve guests. I want someone to make this for me for breakfast! It looks delicious. I love frittata. I eat it for breakfast, lunch and dinner! It is so good and this recipe looks like something I need to make! This looks so delicious! 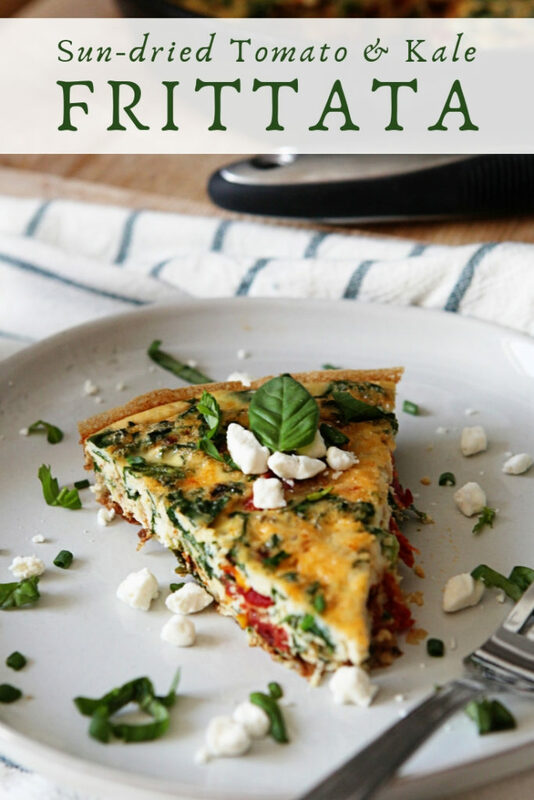 I’ve never actually made a Frittata, but now I want to make this recipe! This looks so good. What a great idea for brunch! I’ll have to keep the recipe handy. Oh now this looks so delicious! Definitely need to make it for my family! It looks so delicious and healthy dish I will definitely try this and I am sure my whole family will like it. This looks like such a yummy and healthy breakfast dish! I totally want to make this ASAP! This looks amazingly delicious! And it looks pretty healthy! We’ve recently gone “low carb” and “low sugar” and I’m looking for new recipes to try! Oh Yum! I am so happy to see this lovely recipe. I can’t wait to try it! Ive never had frittata before. Is it similar to quiche? This is exactly what I’d order if we went out to eat. 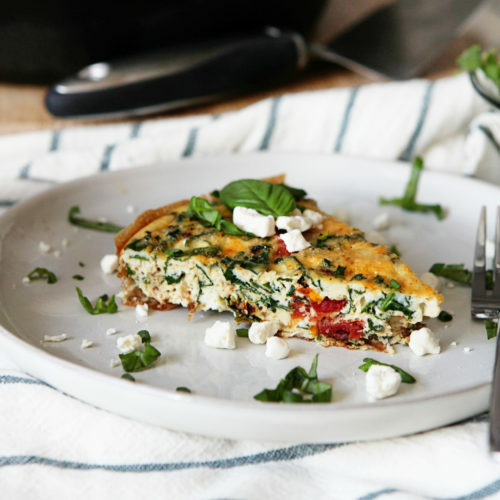 I love the idea that I can make this frittata at home. It looks delicious!